On Jan. 29, 2015, College President Phil Hanlon presented the “Moving Dartmouth Forward” initiative, his plan that implemented policy changes on campus. MDF changes included the implementation of the new housing communities, a hard alcohol ban and a four-year sexual assault prevention program, among others. Two years later, what has changed? When the hard alcohol ban was introduced, the ban received mixed reactions around campus. Nowadays, some students say that it didn’t really affect them. William Paja ’16 explained that it is like the hard alcohol ban never really existed. In a survey conducted by The Dartmouth in March 2016, 85 percent of respondents said they had consumed hard alcohol since the ban’s implementation. Christian Guinchard ’17, a brother of Theta Delta Chi fraternity, said that before MDF, the fraternity scene was more risk-free at Dartmouth. When he rushed TDX just before MDF was implemented, he felt that the brothers and the atmosphere were more relaxed. “On campus, you have this vibe that College wants to antagonize fraternities in any way they can,” Guinchard said. Partly as a result of MDF’s goal of fostering a “safer and healthier campus environment,” according to the MDF website, stricter regulation of social events and alcohol can create lesser known inconveniences. Guinchard explained that the limit on how many registered cases of alcohol allowed per night is one such hassle. According to Isaiah Matthews ’17, individuals just buy hard alcohol themselves instead of the using a house’s funds. He explained that banning hard alcohol has made fraternities and sororities more cautious and more selective of who they let into their spaces. This year, the housing communities have provided students with a different social scene than fraternities and sororities. Imani Graham ’17 says she thinks that housing communities are a good idea, but unlike Yale University, which has a similar residential system, Dartmouth’s infrastructure is not a good fit for the house system. “I feel that Dartmouth is trying to put a system on a place it wasn’t built for,” Graham said. Graham is also frustrated that her new on-campus housing options are limited and she is unable to live in one of the newer, more spacious dorms on campus, Fahey-McLane. For the ’20s, the six-week frat ban, although not directly part of Moving Dartmouth Forward, has implicitly worked in tandem with the new housing communities. For some, the frat ban allowed freshmen to explore many other facets of Dartmouth life that weren’t contained in a frat basement. Jamie Park ’20, South House representative for the Student Assembly senate, explained that the frat ban helped her enjoy freshman fall and explore other social scenes like Late Night at Collis. “It was good that freshmen were forced to hang out with each other and go to events together,” Park said. Julian Bonorris ’17, a member of Bones Gate, is quite involved with Allen House. He said that among their events, his favorite events are the talks with professors. “They’ve put effort into making the housing system an attractive outlet for students,” Bonorris said. As South House senator, Park stated that the housing communities offer a good alternative for students who do not want to partake in the drinking scene on campus. “The housing communities allow students to have a social outlet without feeling left out,” Park said. One of MDF’s goals was to create a more inclusive and diverse environment on campus. However, over the past two years, the College saw events like the Black Lives Matter library protests and campus unrest after English professor Aimee Bahng’s denial of tenure. Chrissy Ragin ’17 said she believes that MDF is failing to address the issues of diversity it promised to remedy. “[MDF] was like a social Band-Aid that they put on [the issues] with nothing really behind it,” Ragin said. One academic focus that MDF has built on recently is providing more academic resources to enhance learning outside the classroom, such as the E.E. Just program, which supports students traditionally underrepresented in STEM fields from matriculation to graduation. Yusuf Olokoba ’20 stated that the program has helped him tremendously by giving him a community to support his academic endeavors. 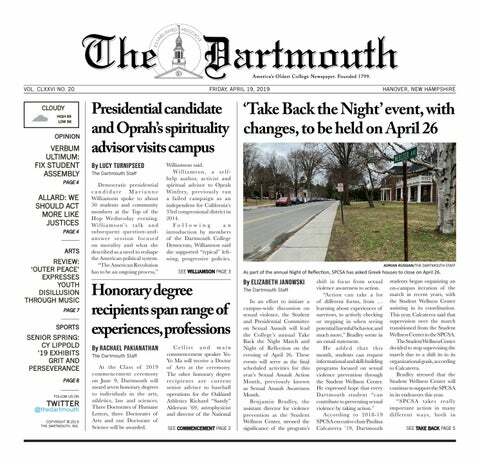 Moving Dartmouth Forward offered widespread changes to the Dartmouth community. Reactions to such changes have been mixed, and time will continue to show the plan’s far-reaching impacts.